Investment bank UBS predicts there will be a surplus of 1,400 airliners at the end of this year, necessitating production cuts at both Airbus and Boeing. The bank made its forecast in a detailed report at the end of August on Airbus parent EADS, warning that the "significantly reduced production rates" required to address overcapacity were "currently not being planned for". It expects Airbus production rates to fall by about 40% by 2012. Separately, lessor AWAS has told Flightglobal's financial news service Commercial Aviation Online that, according to its own internal analysis, there will be an aircraft surplus of about 1,000 aircraft by the end of this year and about 1,600 by the end of 2010. The lessor believes the global economy will enter recovery around the middle of 2010, with air traffic beginning to grow beyond pre-recession levels in 2011, at an annual rate of about 5%. This will reduce the airliner surplus to about 750 in 2011 and to about 400 in 2012. All AWAS figures include regional airliners. In its report, UBS notes that EADS management has been able to deliver on its financial guidance thanks to Airbus's backlog management, in which strong airlines are moved forward in the schedules to take aircraft deferred by weaker ones. However, backlog management is "covering up the need for cuts in production rates", writes the bank. Taking this into account, as well as retirements and the prospect of 700 parked aircraft coming back into the active fleet, the only way to deal with the overcapacity is to cut production, according to UBS. Passenger traffic would have to grow at the rate of an estimated 14% to avoid production cuts, way beyond the 4-5% growth projected. UBS concludes that there would have to be 3,600 aircraft retirements to avoid cutting production, another unrealistic possibility. Les effets de la crise : un surplus d'appareils dans les flottes mondiales : 1400 selon UBS et 1000 selon AWAS pour la fin de l'année et 1600 en 2010 pour AWAS. AWAS (loueur d'avion) prédit une reprise pour 2010 ce qui permettra en 2011 de revenir à un niveau de trafin post recession et de réduire les surplus à 400 en 2012 (y compris avions régionaux). Cependant, compte tenu des avions déjà parqués et qui seront remis en ligne et d'un rythme de croissance pour 2010 et suivantes de 4-5% (prédiction UBS et AWAS plutôt en phase), il ne sera pas possible de conserver les cadences actuelles de production chez les avionneurs. Pour conserver les cadences actuelles, il faudrait selon UBS 14% de croissance du trafic par an ou la mise hors service de 3600 avions (sur quelle période ?). Ce n'est guère réjouissant ! Demand for air travel could begin growing again late this year or early in 2010, enabling Boeing and Airbus to maintain their narrowbody production rates, a new Wall Street analysis concludes. Year-over-year traffic declines among a group of 13 airlines worldwide shrunk to 2.5% in August, down from 8.8% in May and the third consecutive monthly improvement. The trend suggests that traffic growth among the group could be back in positive territory within several months, says the analysis by Jefferies & Co. "While we remain concerned about the market for aircraft financing and weak airline yields and profitability, a continued improvement in the trend for air traffic would enable airlines to more effectively price their product and could support maintaining narrowbody production at current rates," Jefferies analyst Howard A. Rubel wrote in a Sept. 14 research note. While both Boeing and Airbus have seen a dramatic decline in new orders in 2009, huge backlogs have allowed them to maintain robust production rates. Airbus is modestly cutting production of its A320 narrowbody to 34 a month from 36, while Boeing says it sees no need to cut output of its 737 narrowbodies from the current rate of 31 per month. But the weak financial condition of the global airline industry has made investors and suppliers skeptical that the two air framers can get through 2010 without further production cuts. 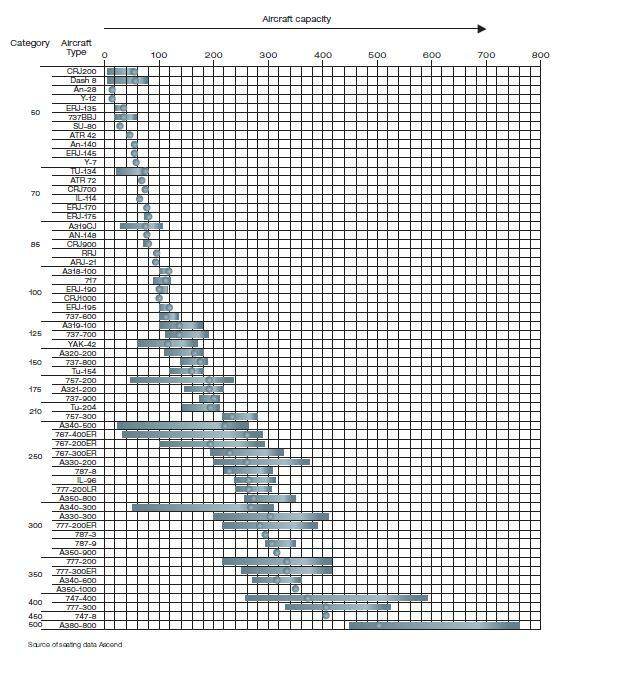 The 13 airlines covered in the Jefferies analysis are Air France, AirTran, American, British Airways, Cathay Pacific, Continental, Delta, GOL, JetBlue, Lufthansa, Southwest, United and US Airways. Moins pessimiste que la précédente. Dans le panel des compagnies sondées, peu d'asiatiques, pas de moyen-orientale, et de low cost européennes. Boosted by a gradual economic recovery, the global airline industry is expected to recover in 2010, industry players concluded at yesterday's Global Strategy Summit, part of the Routes Development Forum in Beijing. "The global economy is recovering slowly now. China and other Southeast Asian countries are leading the recovery and the US is expected to start recovery in the second half of 2009, while Europe and Japan are lagging behind. So we expect the air transport industry to post positive growth in 2010," Boeing Commercial Airplanes VP-Market and Value Analysis Fariba Alamdari predicted at the event (ATWOnline, Sept. 10). The world's airlines suffered a collective loss of $8.5 billion in 2008 and are expected to report a a $9 billion deficit this year, according to IATA (ATWOnline, Sept. 2). "It is the worst crisis in air the transportation industry--2,860 airliners have been parked idle, which is about 13.1% of the total global fleet and [a figure that has risen] 30% over the past 12 months," World Bank Director-Energy, Transport and Water Jamal Saghir noted. But the industry has started to show signs of recovery. "Air traffic recorded only negative 1.2% growth in August, which is mainly attributable to emerging markets represented by Southeast Asia, South America and Africa," Airbus Market Research and Forecasts Manager Arnaud Maheu pointed out. However, more time is required to return to the industry's peak. "I would say it will take two or three years," Assn. of Asia Pacific Airlines DG Andrew Herdman said. Alamdari expects international passenger traffic to return to its peak in late 2010 or early 2011, while cargo traffic will not get there until the end of 2011 or early 2012. "Before that happens, one of the major problems carriers need to address is how to manage excess capacities. Boeing and Airbus need to realize most carriers won't need to introduce new aircraft this year and next year," Herdman asserted. He predicted that the Asia/Pacific region will maintain 6.9% annual growth over the next two decades, slightly higher than Boeing forecast last week. Cette analyse est plus en ligne avec la première de ce sujet. L'article rappelle aussi l'effondrement du cargon, traditionnel exutoire pour des cellules un peu ancien (via conversion) et représentant aussi en cellules neuves une partie des carnet de commande de Boeing (grosse majorité des 747-8F, 20% des 777, 16% des A330). Voici un lien un lien permettant d’ouvrir ou de rouvrir un débat permanent. In releasing its long awaited Global Market Forecast , Airbus echoed Boeing’s comments on market resilience while at the same time offering a different perspective on just how the split between competing models will serve the flying public over the next two decades. Where Boeing forecast demand over the 2009-2028 period to be some 29,000 airplanes , slightly lower on the forecast from 2008, Airbus increased their target from their 2007 forecast to almost 25,000 new airplanes - if anything, the figures show that both jet makers are inching slowly toward convergence in their overall numbers in anticipated demand in the next twenty years. Airbus predicts that demand for very large airplanes, such as the A380 and 747-8 equates to 15% of total value, representing 5% of the world fleet. In contrast, Boeing observed that the same segment would be worth just under half that amount representing just 3% of all units sold between the 2009-2028 time frame. Critically, the most interesting data to emerge from the forecast was this graphic below (p160, click to enlarge). Between the A350-1000 and the A380, Airbus clearly has a product void. Part of the problem with the A380 forecast stems largely from the wide-ranging demand for smaller, long range airplanes as opposed to hub-to-hub high volume flights. 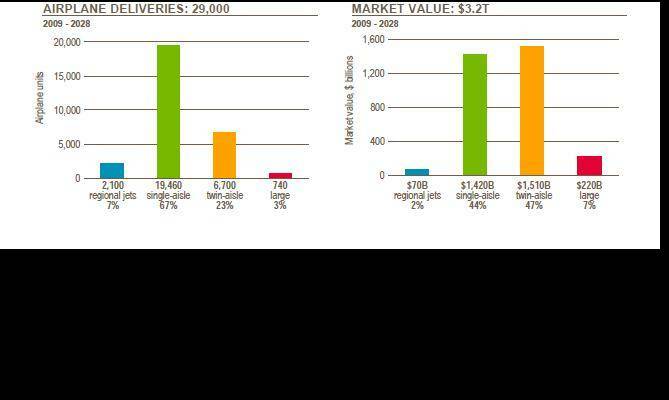 Frequency increases between primary and secondary hubs has eroded the business proposition for large jets and this is reflected in the weak passenger sales of the A380 and 747-8 Intercontinental. Added to this is the marginal step in seating (11%) from the A350-900 to the A350-1000. With definitive specifications on the largest Airbus twin engine jet still shrouded in mystery while engineers focus on weight loss from the baseline A350-900, a possible further stretch of the A350XWB to plug the gap between the 350-525 seat void in the portfolio is compounded by financial constraints as well as engineering resource challenges. The A380 in present guise is not geared up for a shrink - and with the A350 unable to grow beyond the A350-1000 without a new wing, the 777-300ER still occupies a segment that is pretty much uncontested. The only real alternative is the 747-8I, however, with the greater appeal coming in form of the 747-8F, the need to update or replace the 777-300ER is still a distant adventure. The A350-1000 risks cannabilising the already shrinking A380 market niche, despite not being positioned any better than the A380, as reflected by its extremely narrow spread of orders. It is more probable that airlines take delivery of more flexible aircraft in the changing environment before increasing capacity and using very big aircraft - already we’ve seen over half the A380 customer defer deliveries as they try to adjust to dwindling demand and the destruction of yields upon which so many business models have been reliant upon. Compounding the A380 issue is that of engines - by the time the 787 and A350XWB enter service, the engines on the A380 will be over a decade old since inception and given the slow market demand for the airplane, any possibility of a re-engining proposal is almost certain never to materialise given the costs involved. •	Comparaison des prédictions des duettistes Airbus et Boeing. A première vue, elle sont globalement concordante à l’habituelle exception du segment des Very-Large aircraft que Boeing donne à 7% en valeur contre 15% pour Airbus, soit entre 700 et 1400 appareils (dont plus de 50% pour la zone Asia Pacifique pour Airbus). Même la moitié de la valeur la plus basse représente 370 livraisons soit 18.5 en moyenne sur la période, soit plus que la cadence prévue pour cette année. •	Le fuselage de l’A350-1000 est aussi long que celui du 777-300, et dans les deux cas, il est possible de mettre 10 personnes de front en économie (pour quel confort dans l’A350 ?). La surface de pont étant identique, en considérant que l’optimisation de son espace (galley, WC) est au moins aussi bonne sur un avion prévu en 2016 qu’un avion qui a presque 20 ans, il est fort probable que les capacités des deux avions soient en réalité assez proches. Au passage en 3 classes, l’écart « officiel » est de 18 places. •	La capacité « officielle » du 747-8I est de 467 places, il y a une petite erreur sur le graphe sur ce point. 1)	Version transcontinentale haute densité, à l’image de la configuration deux classes d’Emirates, ou de celle d’Air Austral. 2)	Version intercontinentale basse densité, à l’image des configs d’AF et Lufthansa en cours de déploiement. 2) les prévésions d'airbus par région poour 2008-2029, histoire de bien noter que l'Asie représente 28% du marché, mais plus de 50% des VLH. Tableau intéressant à comparer avec celui de Boeing. 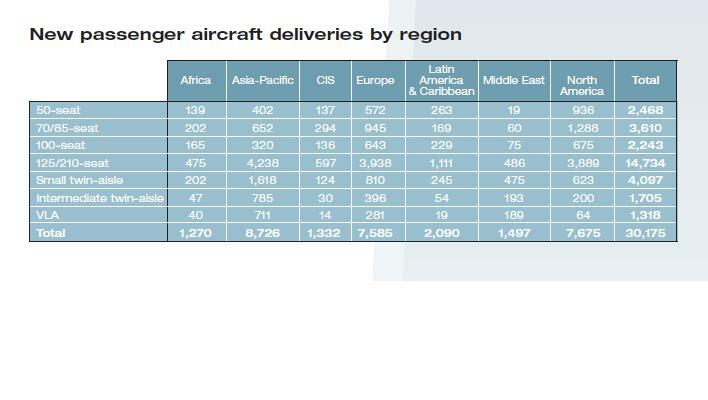 Pour la vision Airbus, je renvois au tableau ci-dessus... où l'on note que le segment <85 places trouve son principal débouché en Amérique du Nord et en Europe. State-owned aerospace conglomerate Aviation Industry Corporation of China (AVIC) forecasts that regional aircraft and 150-seat narrowbodies will account for the majority of China's demand over the next 20 years. At the Aviation Expo China in Beijing, AVIC released its 2009-2028 market forecast which shows the country will increase its commercial aircraft fleet size to 4,233 at the end of 2028 from 1191 at the end of 2008. During this period there will be demand for 3,796 aircraft, it says, adding that 150-seat aircraft will be the biggest category with 1,572. It also says there will be demand for: 408 110-seaters, 466 70-90 seaters and 408 30-50 seat aircraft. As for larger aircraft, there will be demand for 555 200-seat, 298 300-seat and 90 400-seat aircraft, it adds. Even though 150-seaters will still be the largest category, AVIC development and research centre VP Liao Quanwang says as a proportion of the total fleet it will account for 39% in 2028 whereas at the end of 2008 it was 67%. This is because the number of regional aircraft is set to increase dramatically, according to AVIC's forecast. Within the western parts of China there is enormous potential for regional aviation, says Liao, adding that "for the small routes and centres you need the Xian Aircraft MA60." He also says there is potential for regional aircraft such as the Commercial Aircraft Corporation of China (Comac) C919 to ply routes linking western and eastern China. Regional aircraft have a role because "we think there will be a tendency among airlines to increase frequency" using smaller aircraft and to launch more non-stop flights, he says. "Right now the 150-seater is the main aircraft in China's fleet but airlines need to optimise their fleet structure by increasing the size of the regional fleet," he adds. AVIC has a vested interest in regional and 150-seat aircraft. It produces the 60-seat Xian Aircraft MA60 turboprop and is developing a 70-seat MA700 turboprop. It is also the top supplier to the 90-seat Comac ARJ21 programme and the 150-seat Comac C919 programme. There are only a handful of Chinese-built commercial aircraft in service with Chinese carriers today. "But in terms of the China market we are confident we will secure a share of the market in future," says Liao. As for the international market, it will be tough because "we have some very strong" international competitors, he adds. Aircraft-makers around the world are focused on China because it is the fastest growing aviation market in the world. AVIC's 2009-2028 forecast predicts RPKs will average 8.2% per annum until the end of 2028. Growth for the period 2009-2013 will be the fastest with 10.2% RPK growth per annum on average, it says. AVIC pointe l'importance des livres de rabattement... et la catégorie des moins de 85 places. Pas facile de travailler ainsi ! * Les documents d'autorisation de mise en service d'avions neufs, sont simplement retardés de qq mois, sans aucune explication ... alors, ?? A vos poches pour accélérer ?? C'est sans doute une tentative des autorités de freiner la croissance du transport aérien (en raison de l'embouteillage de l'espace aérien), peut-être pour contraindre les compagnies à commencer à évoluer vers des avions plus gros, réduisant l'ampleur du problème. C'était sur ce contexte que s'appuyait l'A330 régional.